There are some important freezing guidelines that you must follow. How long will baby food [cubes] keep in the freezer & refrigerator? Baby food cubes are safe to remain in the freezer from 3 to 6 months. Using baby food cubes within 1 month to 3 months is really more prudent. Due to the amount of water crystals that tend to build up with baby food purees, and due to the fact that nutrients may leach/evaporate upon thawing because of the water crystals, it is more prudent to use your frozen baby foods cubes as soon as possible – 3 months of storage tops. We always recommend using within 1 month if at all possible. Many authoritative guidelines will say that most fruits and veggies will keep from 8 to 12 months in the freezer. This is mostly true of foods that are frozen in their natural state. This is also assuming that the freezer remains at a constant sub-zero temperature. Storing foods in a deep freezer is best should you wish to keep frozen foods for that time frame. Remember that when certain books give freezer time guidelines, they rely on the typical guidelines for fruits/veggies that have NOT been cooked and turned into purees. How long with baby food cubes keep in the refrigerator? In the refrigerator, it is recommended that fresh pureed homemade baby food be stored no longer than 48 hours (many food safety authorities say that 72 hour is fine.). This limit ensures that bacteria growth in the puree is kept to a minimum and that the food does not take on the “taste of the fridge”. This “rule” applies for veggies, fruits, meats etc. If you do not plan to freeze your homemade baby food, I suggest that you make the puree on a day to day, or every other day, basis. For example, one sweet potato may be baked and then you may freeze one half without pureeing it and then puree the other half. This method will help cut down “waste” and also allow for food safety. 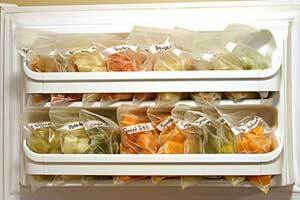 Can I safely use frozen vegetables or fruits to make baby food purees and refreeze them? YES. You can refreeze frozen veggies & fruits. Using frozen fruits and vegetables is the second best option to using fresh foods. The process of flash-freezing (foods being frozen at a very low temperature and frozen very quickly) actually preserves and allows for optimal nutrient retention. One of the most commonly asked question is “Can I safely use frozen vegetables or fruits to make baby food purees and refreeze them?”. There are no studies or research to show that refreezing is negative and/or may adversely affect health. The caveat is that you must cook the foods prior to refreezing them. Frozen vegetables and fruits are NOT COOKED prior to being frozen. Frozen veggies are NOT cooked when packaged and so they must be cooked prior to eating. Please be sure to read the label of your frozen veggie bags as a few brands of frozen veggies may be pre-cooked; you would not want to refreeze these. The fact is, cooking foods deplete more nutrients than does freezing foods. Contrary to myth, freezing foods (fruits and vegetables in particular) does NOT deplete 100% of that food’s vitamins and minerals. The process of freezing, if kept at a constant 0 degree temp does not contribute to a TOTAL loss of nutrients – if it did, then the majority of the population would be malnourished as we rely on and eat a large amount of frozen foods. If you ever forget what the “rule” is, remember this example : you can take out a roast that was frozen uncooked & raw, thaw it, cook it and then freeze the leftovers for another meal. Once you have thawed the leftovers, you should never re-freeze the leftover-leftovers. Q. Just reading the section on using frozen food to make baby food and then refreezing. I was just concerned because on the package (Green Giant Peas) it says to not refreeze thawed product. Do you know why that is?? A. You should never refreeze a thawed product, that is correct. Refreezing thawed products may affect the taste and quality (and possibly very minutely, the nutritional value) of the product. You should ALWAYS cook a thawed product prior to re-freezing it. Cooking a thawed product will allow you to then re-freeze it for one cycle. Keeping a bag of frozen veggies or fruits on makes it simple for you to serve up a meal. You don’t have to puree the whole bag, just cook and use a handful at a time. Using this method, you spoon or pour your baby food purees into regular ice cube trays and then cover with plastic wrap. The ice cube tray method of storing homemade baby food offers you many advantages. There is minimal waste as you use only 1 cube at a time and will not have to toss away much food; such as you toss away when using commercial foods. Once the purees have been frozen in the trays, you simply pop out the cubes and use as needed. Using this method also allows you to make several trays at a time so your time spent in the kitchen making baby food is decreased. 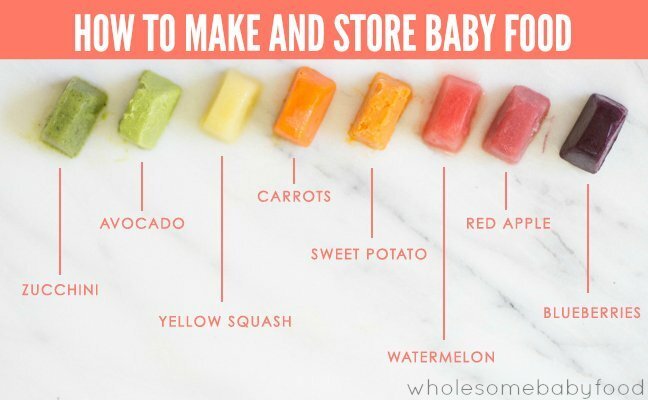 You may transfer the baby food cubes into freezer bags, freeing up your trays for the next batch of food as well as freeing up some freezer space. If using the freezer bag method for your food cubes, be sure to label the bags with the type of food and also date the bags. This will help you to quickly grab a cube from a bag of veggie and a bag of fruit without having to guess what you have in the bags. It also allows you to keep track of the length of time the food cubes have been in the freezer. My baby food cubes are frosty and have ice crystals on them – Do my homemade baby food cubes have freezer burn? Don’t be alarmed if you see ice crystals forming on your baby food cubes. As mentioned earlier, this is NOT freezer burn rather it is the excess liquid used to make the puree that rises and freezes at the top of the cubes. These crystals or frost are not dangerous and will not make your baby food cubes inedible or harmful. 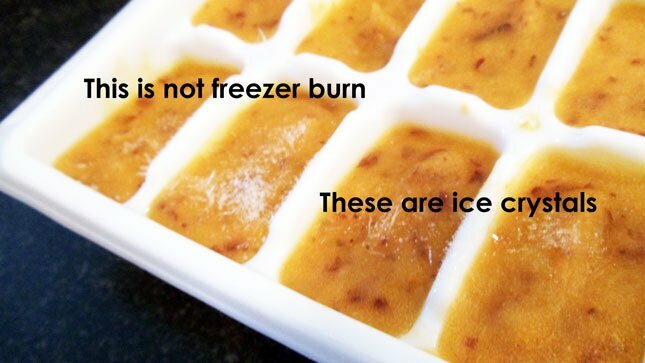 Freezer Burn – What is it and How may I spot it? Freezer burn looks like grayish brown spots on the frozen item. It appears as a leathery type texture and is easily noticeable. Crystals on frozen foods are not freezer burn but are a result of any excess liquids being frozen and forming ice crystals. Freezer burn does not make a frozen food harmful; it simply makes the areas affected very dry. The only thing that may suffer in foods that have a lot of freezer burn is the quality. You can cut away the burned portions and still be able to use the unaffected area of the food. Freezer burn results when excess air in the frozen package descends on the food. Try to eliminate air pockets in the packages you will be freezing to help stop freezer burn. Can I use glass jars for freezing homemade baby food? Can I use Gerber/Beechnut glass jars? Glass that is not specifically manufactured for freezing has the unfortunate ability to crack, leave behind tiny, microscopic shards and fragments and also is prone to bursting. Baby food jars are not manufactured for freezing or for extreme heating. BALL, makers of home canning products, manufactures 4 ounce jars specifically for freezing as do other manufactures. Many people do freeze in baby food jars but I do not advocate this whatsoever. After all, you’re making baby’s food because you want the best nutrition and health for your little one; why take a risk by freezing in jars? There are glass jars on the market that are specifically manufactured for freezing and those jars should pose no hazards at all. Gerber containers do not have any specific markings or labeling to indicate that they are good for either temperature extremes. I have emailed Gerber and they have said that they do not recommend using their containers for storage at either temperature extremes such as freezing or extreme heat (microwaving). Feel free to contact Gerber as they were very quick with their reply to us. I do not advocate freezing foods in any container that is not specifically labeled for freezing. There are certain “grades” of plastics that are specifically manufactured to withstand high temperatures and/or freezing. You may look on the bottom of the containers for the plastic symbol and then look the symbol up here at American Plastics Council. Please note that these codes do not necessarily mean that the container you are using is 100% safe for heating or freezing; the codes will give you a baseline to help with your decision. What is the “rule” for freezing Meat Purees or Meat Combinations? Meat Purees and Meat “Dinners” that you have mixed may be frozen just as you would fruits or veggies or combinations. It is safe to freeze meats that have been frozen when raw and uncooked, thawed, cooked and then puréed. You should not freeze meat purees from meats that have been frozen when raw, thawed, cooked and then frozen and then, thawed again. If you ever forget what the “rule” is, remember that you can take out a raw frozen roast, thaw it, cook it and then freeze the leftovers for another meal. Once you have thawed the leftovers, you must use them within 48 hours; you should never re-freeze the leftover-leftovers. Can I Use Previously Frozen Breast Milk or Formula to Make and then Freeze Baby’s Vegetable or Fruit Purees? You may freeze purees that have been mixed with formula. Formula should not be frozen in the form of bottles or cans. For example, you should not freeze formula bottles that you have mixed nor should you stock up on pre-mixed formula and freeze that. As the formula companies note, freezing formula causes a separation of the fats from the liquid and texture suffers. There is no health risk to freezing formula, just texture and quality. Think of it as the same as freezing a gallon of milk – it’s not dangerous but it makes the quality of the milk suffer. It might be easier to freeze your purees without adding any extra liquids. If need be, thin your puree food cube(s) when it comes time to feed your baby. Should you decide to do this, you simply thaw the “un-thinned” food cubes and then thin the food cubes to the desired texture that your infant requires.